Awesome day out, spectacular views, the guide really knew his stuff, he made the day really special. I’d definitely recommend this trip. The tour was nicely organized. The guide Rod was more than friendly, just like a close friend. We are blessed to go with perfect weather, sunny and breeze. Blue mountain and three sisters are spectacular, and you cannot miss. We took a ferry on the way, which was really a great choice. Please note that there are steps and thus it is not suitable for the elderly. I highly recommended this tour. This was the most excellent side trip I have every been on. The scenery was breath taking, the guide was excellent and knew the area well. Everything was taken care of by the tour company including tickets to the events and meals. We had nine people on our small tour van. Much better than a 40 person bus. 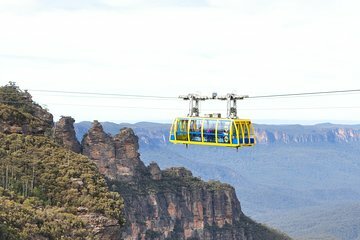 Would highly recommend this tour while in Sydney. A very rainy, foggy day took away our ability to really see the beauty. Stick with small group tours! The wildlife stop allowed us to see some very unusual animals. Very interesting. Great experience - the ability to see the Blue Mountains, visit a rain forrest and feed Kangaroos and meet a Kaola at Featherdale made for a complete day in a small gruoup of 14 that bonded on the trip. This proofed cost and time effective for independent travelers. The Blue mountain day trip was very interesting. Rod, our guide was very informative, as well as very funny. As we reached the Three Sisters, the sky was covered in fog, so we were not able to see the view. However, as the day went on, the fog lifted and Rod took us to a different viewing point where we were able to take some nice pictures. A well worth doing tour. A terrriffic day. We are only in Sydney for five days and this day trip was a way to get out of the city and see a tiny bit of the country. We loved the small group. Our amazing guide, Alecks, had us all at the scenic world attraction before the huge amounts of large buses arrived, so no waiting for the fun rides at Scenic World. Lunch was surprisingly good, our entire group agreed. Featherdale was definitely a highlight. Alecks was well organized, had a such a fun personality, kept us on schedule and was an excellent guide. He seemed to have an abundance of knowledge on all things Australia. We are so very glad we made this choice.